Our blog has gone from strength to strength, and is well worth reading, with excellent articles, news items, photos and useful links. Our Facebook Group: Waitemata Unite has also become a place of lively discussion and information. any policy decided in accordance with these Rules. b) to recruit and organise workers, including marginal labour, unemployed and beneficiaries. 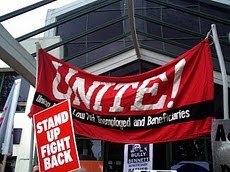 Unite was formed during the 1990’s in a time of high unemployment and during the time that National brought in work for the dole. Although we don’t officially have work for the dole now, work is becoming increasingly transient, if people can get work at all, and wages are so low that people need numerous top ups from WINZ to make ends meet. Legislation such as the 90 Day Act, passed around the 26 th November, 2010, increases the likelihood that employment periods will be short and interspersed with unemployment. Many people on community work schemes do de facto work for the dole programs, including, as we found out this year, people in sheltered workshops who have no legal right to a minimum wage. Amendments to the Social Security Act in September 2010 meant that nearly all beneficiaries including the sick and parents with family responsibilities are now expected to be available for work, and subjected to punitive sanctions if they fail work tests. The legislation came after WINZ had already removed as many people as possible off the invalids benefit, which may soon be the only refuge left from compulsory work testing. WINZ also now increasingly employs designated doctors and “regional health advisors” to make decisions about people’s work capacities and benefit entitlements. In August 2010 the Welfare Working Group, headed by ex Chamber of Commerce member, Paula Rebstock issued its preliminary report or “Issues” paper. 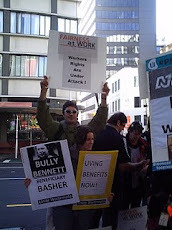 Its extremely antagonistic view towards anyone getting state support, its brief not to consider whether benefit levels were liveable, and its ‘relentless work focus” is echoed in WINZ culture and in the September 2010 legislation, although the stance taken by this razor gang is a lot more extreme than what the Government has so far implemented. The Rebstock Razor gang has helped to create a polarised climate where rednecks such as Michael Laws and lately Don Brash are coming out in force, and on the other hand many people are defending or sympathising with beneficiaries including mainstream journalists such as Tapu Misa, Simon Collins and Gordon Campbell, and groups such as the Alternative Welfare Working Group, AAAP, and CPAG (Child Poverty Action Group) and of course, ourselves. We are the only group that is union based and consistently calls for a united fight back of workers and beneficiaries . The Welfare Working Group put out its “Options Paper” on 26 th November 2010. The Alternative Welfare Working group put out its own report in late November and in December called for all benefits to be increased by 50%. In late November some of us attended the Unite National Conference and AGM. Keith was our official delegate. We presented two remits to the conference, one asking for a reduction in fees for beneficiaries back to $1.00 per week, and the other asking for a beneficiary representative on the National Executive. Both these remits were defeated, however there was a small element of support for each motion, although from different sections of the conference for each motion. The worst experience for me after speaking in favour of one of these motions, was to hear a young Unite organiser, stand up and publicly admonish us for coming each year to national conferences and having something to say. This was followed by some strong support from some Maori female delegates (security guards), who agreed with me that many people who currently have jobs, including delegates at the conference, could well lose them in the coming years. The Unite National Conference was followed by an Activists Conference, also organised by Unite, in which we led a workshop entitled “stopping beneficiary bashing”. The formation of the new group Auckland Action Against Poverty gives us the possibility of another group with whom to organise or attend protest actions about benefits. 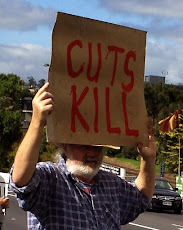 We jointly organised a picket outside WINZ, Henderson, on December 3, 2010, International Disability Day. I made a number of placards for this picket which we are still using. Waitemata Unite also had its own leaflet which we handed out to beneficiaries during and after the protest, which met with a lot of agreement. We signed up some new members. I wrote a report of this protest for Indymedia which was well received and generated a lot of discussion. 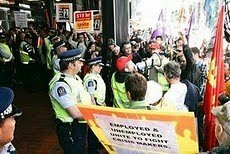 January 2011: Child Poverty Condemned, Auckland Solidarity Victory in 90 Days Practice. In January 2011, following a complaint from the CPAG, the United Nations wrote a damning report about child poverty in New Zealand where 20% of children live in poverty. The government picked up the family violence aspect of this only and promised more surveillance. The first of the Arab Spring protests began in Tunisia, after an unemployed man set fire to himself, and our Secretary wrote a letter of solidarity with the Tunisian people. Michael Laws wrote a column calling for “ferals” to be stopped from “breeding. In January WINZ was giving advice that people sacked under 90 day legislation would have a benefit stand down for 91 days. This illegal policy seems to have been reversed in later months but we must be vigilant against any case officer trying to implement it. 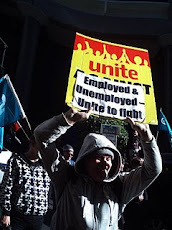 Also in January representatives from Waitemata Unite joined a group of rank and file unionists, “Auckland Solidarity”, which helped to organise a protest against a fast food outlet that was using the 90 day law. One protest was enough to frighten the employer into changing his policy and many other employers have followed suit. Auckland Solidarity later went into recess-for want of a fight? On February 22nd, 2011, the day of the Christchurch earthquake, we joined with AAAP to protest the release of the final report and recommendations of the Welfare Working Group. Its pernicious recommendations include work testing the sick and disabled, mothers with young babies as young as six weeks, and mothers with newborns who have a second child while on a benefit, contraceptive injections , compulsory medication and drug testing beneficiaries. We gathered outside Henderson WINZ and marched to protest outside Paula Bennett’s office. We were met with a strong police presence and some police brutality, especially towards a mother with a baby in her arms. There were some arrests, but no charges were laid. Both the WWG report and the protest were somewhat lost amongst the concerns about the Christchurch earthquake but it was reported on Maori television. I spoke at this rally about National being an anti-woman, anti-mother and anti-child government. Around March and April several of us attended a public meeting at Paula Bennett’s office advertised as “Are we Safe on our Streets?” Many community representatives were there to complain about lack of funding for their groups eg women’s refuges, self defence groups. These groups may have been there through being informed by myself of this meeting. Also around this time Dave Bedggood and myself updated the original recruitment leaflet which I wrote last year entitled “Why you should join Unite” to include the changes brought about by the September legislation and the implications of the Welfare Working Group recommendations. Our members have handed out these recruitment leaflets to people at WINZ offices throughout the year, and they have been well received. We have had a number of new visitors to our branch meetings, and some new members. Branches we have been to include New Lynn, Henderson, and Glen Eden. On 30th April the Mana Party was launched at its first hui in Pt Chevalier. On 31st May, 8 cabinet ministers including Paula Bennett and Anne Tolley were appointed to a committee to consider the implementation of the WWG recommendations. I wrote an article, “Beneficiaries Labelled Mentally Ill “, about the co-option of health professionals, the perception of not having a job as being a mental illness, and the corrupt practice of employing designated doctors and Regional Health Advisors to overturn decisions of the beneficiary’s own doctor or health professional. 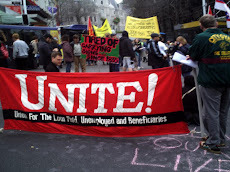 This was published in our blog http://waitemataunite.blogspot.com and in Class Struggle. On Friday 22 July, we attended the AAAP picket of Iain Duncan Smith, UK Conservative minister and welfare adviser outside a hotel in town, where he addressed Maxim institute. On Monday 24 July in the freezing cold our branch picketed and attended a Paula Bennett public meeting on health where she actually said –let the poor “ eat weet-bix. “ Keith wrote the publicity leaflets for this picket and for our forum. On the 31st July we held a forum entitled Defend our benefits wages and services. We had an interesting discussion but were disappointed not to have more attendance from our new beneficiary members and their friends. News items appeared about children’s hunger, and about the ending of a Red Cross programme in schools. The CPAG released a report about 20 years widening inequality and children’s poverty and hunger. Fonterra was in news for sky rocking milk prices despite huge profits. August : Our Clinic at The Hub , Peer Advocacy and Benefit Fact File. In August we started a fortnightly clinic on Wednesday mornings at the Hub, at the Ranui Caravan Park, in Swanson Rd. The Hub is funded by the Auckland Council and is a space for community groups and residents. We hope to recruit members and help members with benefit and housing issues. We attended a forum organised by the PSA aimed at bringing unions and community groups together. On behalf of our branch, I organised a three day advocacy Advocacy Course, from 29-31 August. The teacher was Kay Brereton from the Wellington People’s Centre. People from many community organisations attended. We learned valuable information about WINZ practices and how to challenge them, for example when they breach the law. I bought a second copy of the Benefit Fact File for our branch. This file, issued by the Wellington Peoples’ Centre has valuable information about benefit entitlements. The only problem with it has been a slowness in updating it, but our original file is now up to date. Our new member Alison, also copied the Social Security Legislation for us at the Union Union headquarters. I hope that attending this course has given our members who attended more confidence in helping beneficiaries who may join our union. Some of us are now regularly acting as peer advocates for each other and as advocates for new members. Beneficiaries increasingly need help with problems with WINZ practices which may be completely illegal and are often hard to make accountable, especially with no designated case officer per client. We voted to support Mana candidate Sue Bradford‘s campaign for the party vote. John Key advocated compulsary income management for youth. We were visited by Hone Popata, who wants to start a beneficiaries’ union in Kaitaia. Our current Vice President Amy Carlin resigned. She is a busy mother of new baby Eva. On October 1st, we attended the March of Solidarity organised by Hone Popata, with participation by Maori, students and many oppressed groups. A few days before, students including some Unite members had occupied the Owen Glen Building at the university. At the time of writing we expect to attend the international October 15th event; modelled on Occupy Wall St. Finances, Membership and Fees transfer. We probably have about 45 members who have at some time joined our branch. However paid up members are small in number at present, so unless current members pay their fees immediately we will not have enough paid up members to be able to send a delegate to the Unite National Conference and AGM. So I urge everybody to pay up. This year we introduced a new category of Associate Group membership which enables those with little money to join in a group of up to four and share one fee-but only one of these members can become an official Unite member for Unite purposes. The requirement of Unite National Executive for us to regularly transfer our fees to the Headquarters and in theory get it back again immediately has not been working very effectively yet. We did a transfer in December 2010 and again around June 2011. It took a long time to get our December fees returned. We are still waiting for our June transfer to be returned. Paul took a break from being the treasurer whilst he was studying for about three months this year, so it was Keith and I who did the June transfer. As former treasurer and current President I still find it necessary to do the overall supervision of the financial transfers and negotiations with Gerard Heihir, Unite President. We have had several new people attending meetings and joining the branch, but only some have stayed on long term. It’s always great to meet new members, so to those who are new now, including Alice, our new Vice President-a big welcome to you! We are the 99%: Occupy Queen Street!